The Rotary Club of Madras East (RCME) this year has focussed on Education and Vocational training, with the adoption of a Government School in Urapakkam. The Govt. Adi Dravidar Higher Secondary School (GADHSS) in Kilambakkam, is located in Kanchipuram. This district is home to a population of more than 100,000 socio economically backward people. About 75% of the students of the school come from officially considered ‘Below Poverty Line’ (BPL) homes by the government. RCME has spent approx. US$ 72,000 to provide 290 benches and desk sets, playground equipment for many outdoor and indoor sports, 30 computers and a computer lab, a functional physics lab. An industrial capacity photocopier, printer and scanner machine has also been donated to aid teachers in preparing work material for the students. A toilet is also built for boys similar to the girls’ toilet complex and garden built there last year by the club. Many additional civil repairs, electrical wiring, painting, levelling of playground and creating of green areas with benches for children to sit on have also been done. Rtn. C.R. Raju, District Governor, Rtn. K.R. Ravindran, President, RI District 3230, Rtn. Jayanthi Govindan, President, Rotary Club of Madras East along with other dignitaries from Rotary Clubs. Apart from the contributions from RCME and RI District 3230, the Rotary Club of San Antonio, Texas, RI district 5840 and the Rotary Club of Irvine, California have also supported this project and has been matched 100% by Rotary International. The Rotary International also strongly encourages teacher and student training programmes along with equipment donations. RCME has organized Training the trainers, improving English and teaching skills through computers for teachers. 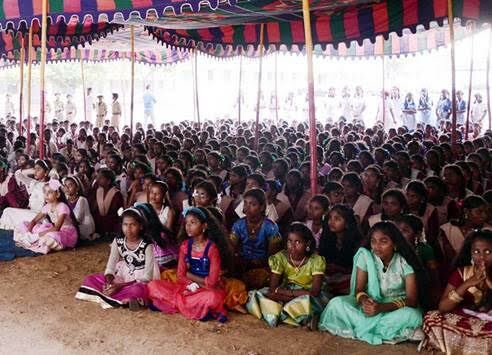 A healthcare NGO is partnering RCME in educating the boys and girls in separate batches about reproductive & sexual health, hygiene and sanitation practices. Rotary Club of Madras East (RCME), chartered in 1985, is a proud member of Rotary International, and ranked as one of the premier clubs in Rotary District 3230, currently comprises 124 members, drawn from diverse fields, including professionals and industrialists. The club has and continues to execute many long sustaining Service projects, some of which are still active after 10 to 15 years, causing a significant impact in the lives of thousands. Some of our signature projects include the Chennai Community College - East, Winner’s Bakery & Training Institute, Transformation of Kolathanallur village & adoption of Kannagi Nagar, donation of a Mobile Blood Bank Unit to VHS Blood Bank, and a Mobile Cancer Screening Unit to an NGO Penn Nalam. Most of the projects are still active after 10 to 15 years, causing a significant impact in the lives of thousands.